"...The British government is looking at the Judson case... 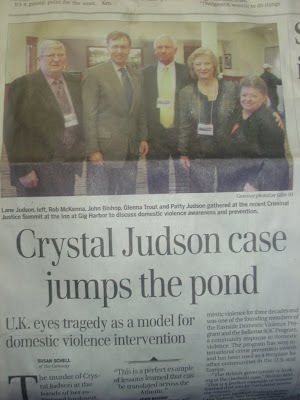 This is a perfect example of lessons learned that can be translated across the Atlantic... We've been acting as a conduit between the Judson family and their experiences and our ability to channel that straight into the discussions in London... One of the main areas of interest is to help identify how to protect a domestic violence victim if the perpetrator is a serving police officer... We have similar problems in the U.K. with domestic violence. Police officers have a track record of 'protecting their own'... A tragedy becomes a catalyst for better work being done to raise awareness..."
U.K. eyes tragedy as a model for domestic violence intervention. The murder of Crystal Judson at the hands of her estranged husband, David Brame, in 2003, sent shock waves across the state. The waves created by that event, and the effect it ultimately had on the justice system and the Tacoma Police Department, have now made ripples on faraway shores. The case is currently under review by the United Kingdom as a model for changes to its own justice system, due to the efforts of a couple living in the U.K., John Bishop and Glenna Trout. The two were in Washington when the Judson murder made TV headlines. Brame gunned Judson down in front of the couple’s two children, then turned the gun on himself. After years of abuse, Judson had separated from Brame, Tacoma’s police chief at the time, and was just beginning a new life. The case hit home for Bishop, a retired officer from the Suffolk, England police force, and Trout, a former lietenant with the Bellevue police force. Trout has battled the issues of domestic violence for three decades and was one of the founding members of the Eastside Domestic Violence Program and the Bellevue SOC Program, a community response to domestic violence. The program has won international crime prevention awards and has been used as a template for other communities in the U.S. and Europe. Since the incident, Crystal’s father, Lane Judson, has become a tireless crusader in the battle to stop domestic violence. He is a guest speaker at conferences nationwide and supports the Crystal Judson Family Justice Center, an organization that seeks to promote domestic abuse awareness. He urged the Tacoma Police Department to basically rewrite the book on its domestic violence policy when it involves a police officer. Bishop and Trout were following the Brame case and were aware that Lane Judson was conducting public speeches. They tracked him down through the Internet and the two families have since become good friends through their work. Another main focus is looking at the policies and procedures here (in Washington) relating to primary responders and supervisors, he said. Trout said in Tacoma, if a domestic violence call comes in that involves a police officer, there must be two responding officers and a supervisor. Bishop and Trout are currently in discussions with Davina James-Hanman, the director of the Against Violence and Abuse project in the U.K.
Trout said in the past, domestic violence calls in many areas of the state were considered a nuisance, but that began to turn around in the late 1970s. A key element in preventing domestic abuse is to have men hold each other accountable for their attitude towards women, Trout said. Trout said no one should turn a blind eye to a family member or friend who is being abused.